I have been creating the Xen maps, and despite my best efforts at creating adequate detail the look is very drab. This is mainly attributable to the color scheme of the Xen textures. 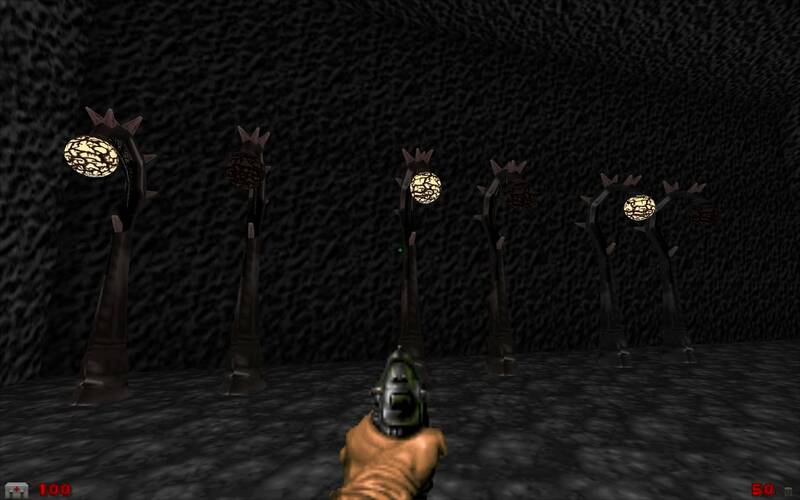 Also, the Half-Life resources for the Xen maps are very limited, especially when compared to the Earth maps. Accordingly, I am looking to add some color and light via these items. 2. A model of a wall-mounted tech lantern, suitable for a space station. Ideally, there'd be 2 versions - one with a white glow, and one that appears to be turned off. A single switchable model will also work. I'm guessing the basic model is already available in existing resources. 3. A wall-mounted model of the Chaos Symbol. I have co-opted the Warhammer picture as a texture. 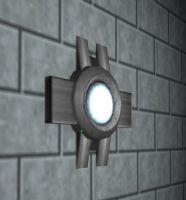 However, as I am making this symbol a theme in the new Xen maps, I think it would be great to also have a model. This is an example of a simplified Chaos Symbol. I'm guessing this will need to be created from scratch. This is a very, very simple model that is intended to be used as a lamp. It' basically just a triangular shape, but it might be useful (other colours are available). This one is called "horny lamp" and the red bits do indeed look like horns. I haven't looked at the model closely but I think it will need a bit of reconfiguring to work, possibly have the horns removed and have something added to be a bright centre to it behind the bars. This one looks interesting. It's called "gothic lamp" but it also has a bit of a Xen-like vibe to it. 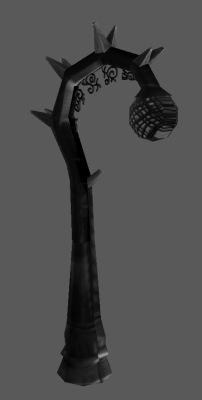 Again, it will need quite a bit of reconfiguring to be a GZDoom compatible model. This one is a bit medieval-ish looking but not really the sort of lantern that you posted. I think it looks too human-produced to be on Xen. It has variants with a chain (for hanging) and a lamp-post version. On the techy side, I thought that this might be suitable. I used it in my Genetech mod, so it can be grabbed from there (you are, of course, free to use anything from it that you fancy). If you need Sitters' models, I think I have all of his model packs safely stored away. I've also got a pile of other stuff. Unfortunately, the big model resource directory that I had, and where I knew all the models pretty well, got lost with a corrupted hard drive a few years or so back. I still have a models directory with 2GB of models and skins in it but I am not familiar with all of the content and much of it is still in ZIPs/RARs etc so I'm not really sure all of what is there. If you have a specific requirement for something that doesn't already exist, I've found Willem Sitters very approachable in the past. He has made a few models for me and can turn them out surprisingly quickly. It might be worth shooting him a message and asking him to do something for you if you've got something particular in mind that isn't available elsewhere. I know that he is finishing up his current Risen 3D map but he much prefers the model making side of things to making maps. Thanks, Boss. The first item you showed looks like it ought to work quite well with the Xen atmosphere. A "shorter" variant would also go nicely with the longer version you've displayed. Perhaps the shorter version in bright, glowing red and the longer version in bright, glowing blue (or vice-versa). Both these colors will contrast very nicely with the blacks and greys of Xen. Would you please send me whichever model you already have? If you have the time, you can make the shorter variant and send it to me. I like the "gothic lamp", which resembles those attacking "trees" (the nekkid ones). 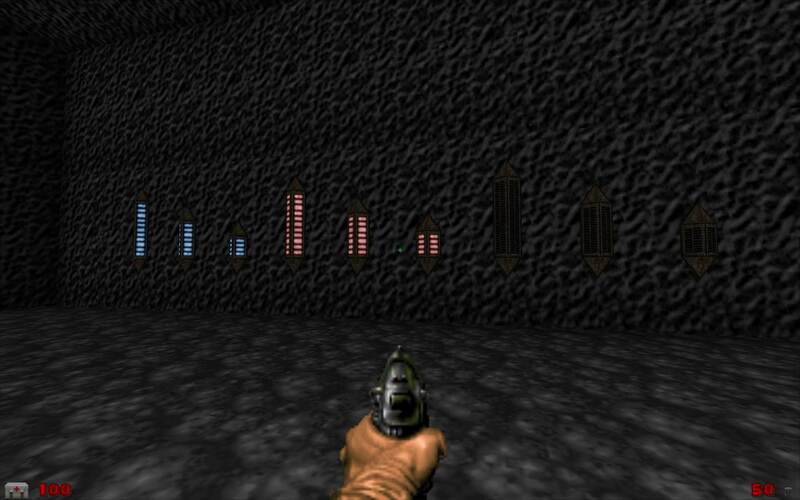 However, if it will require rework to adapt to GZDooM, I say we leave it for now. Especially given your hectic schedule. The techy model will definitely work in a space-station setting. I'll pull it from GeneTech (which, btw, is getting much-deserved buzz again on ZD forums). But if you have it handy, please send it to me. As for Sitters' models, I too had downloaded many of his packs. I just couldn't find them on the computer I was using at the time I created this thread. Don't worry about sending me anything from Sitters; when I get a chance I'll dig them up to see what I can use. Moreover, if you send me the 2 models I won't need to poke around any further. I've run out of time today but I can certainly make a shorter version of the first lamp. It's an incredibly simply model. There are a few skins with it too so I can just put it all in the same file and you can choose which ones you want (I'll make versions that look good on the shorter lamp too). I'll take a closer look at the gothic one to see how easy the conversion is. If I have time, I'll do it. I don't have the techy-one handy so pulling it from the mod would be best. I don't even remember where the model came from. I think it might be a Jedi Academy one that I made a new skin for when I did Gene-Tech. I'll get on to this tomorrow after work. No hurry (and certainly don't push yourself to get this done). I'm far, far from completing the Xen/Space Station hub, and the lamps are decorative; they can easily be added right at the end of the mapping process. The little wall lamps were easy. You have three sizes (original, medium and short) in blue, red and off. The "off" ones don't look that much like they match up with the appearance of the "on" ones but that's what the original skins looked like. They are set so that if you place the thing they are attached to 2 units in front of a wall, they should look as if they are on the wall. I also coloured the lamp stand to have a hint of pink because I thought that was more Xen-like. The skin for the spikes around the back already had a veiny sort of look to them (albeit in grey) so it made sense to make those bits look a bit more fleshy anyway. If you don't like them completely pink (I'm not convinced), I have included a "combo" version with pink spikes and a grey post. I've only applied it to the two right-most lamps in the map but the skin will fit any of the variants. I can easily do other combinations if you want. The reason for the three variants is because I thought that the curly wrought iron-looking bits around the inside-back looked far too human-made for Xen. So, I removed those parts on one model. Then, just for an additional variant, I also took off the structure that supports the wrought iron bits. I think the middle one looks best but the slightly plainer one on the right could be used for a bit of variety. Personally, I don't think the one on the left (the original one with the wrought iron bits) is correct for Xen. If you decide that you don't want the wrought iron bits, the skin can be simplified to not have transparent bits (the bottom right quadrant can just be removed and filled completely with black) or it can just be left as-is because the two edited models don't even use that part of the skin. It isn't that important but it might save a few bytes. I have also made brightmaps for the skins (which is why the "on" ones look bright) but I have not defined any dynamic lights for them. Obviously, that should be done to make them look their best. It would be easy to set them up as switchable decorations too if you need to change their on/off state during play (I think you may have already got lamps like this). Anyway, load up the following PK3 for a look. Let me know if you need any changes made. Oh, wow! Those look great, and will significantly improve the appearance of the maps. As for the goth lamp, curiously, I quite like the original model with the "human" wrought-iron design bracket. The curves and points seem to match the vine-like texture of the lamp shade. If you strongly disagree with its adoption into the game, I'll defer to your choice of the second design. At any rate, thanks for all your work and your endless advocacy for my initiatives. I certainly don't strongly disagree about the goth lamp and if you are happy with the original, that's fine. I don't know what all you have planned but some slight variation in lamp style might be useful anyway (different lamps in different areas or something). Given that they all use the Same skin and the model is only a single frame, there isn't much overhead in using a couple or so variations. I certainly don't strongly disagree about the goth lamp and if you are happy with the original, that's fine. Indeed, I'm very pleased with the look of the first version. .... some slight variation in lamp style might be useful anyway (different lamps in different areas or something). Given that they all use the Same skin and the model is only a single frame, there isn't much overhead in using a couple or so variations. Agreed that the variants only add about 60 kB to the file size, and it makes sense to include them. For my part, I wasn't able to detect the difference from a distance, and it was only because you pointed it out in your post (above) that I noticed that there are 3 variants of the same model. But in regard to redundant resources, perhaps we can dispense with the grey variant of the skin. I summoned the relevant variants, and could just barely tell the difference. And once I had added in a pointlight (reddish, in this case) virtually the entire model took on a pinkish hue. Goth lamp models have been tweaked to make the skin mapping look a bit better. It's still not as good as I'd like but I don't have time to make a new skin and model right now (even though it's not a particularly complicated part of the model to remake). At least the horrible mis-match of the horizontal line that was visible right at the front of the lower part of the lamp post has been minimised. All of the Goth lamp models (GLamps 1 2 and 3) have been updated as have the on and off skins. However, they are just direct replacements for what I sent before so you can just drop them in with minimal fuss. I also set up the lamps to be switchable decorations. So, if you want a lamp that is on, just place it in a map. If you want a lamp that is off, place it in a map and set its flag so that it is dormant. If you want to change the on/off status, use Thing_Activate/Thing_Deactivate (not sure why I'm telling you this; I'm sure you know all of the above). I've also made them solid and given them dimensions that seem about right. I didn't bother giving them dynamic lights because you already have that covered by the sound of it. Anyway, try the following PK3. (It only contains the Goth lamps, not the wall lamps because I didn't change their models). The decorate and modeldef should be reasonably easy to follow ad apply to the wall lamps. The only big difference is that you'll probably want to make the wall lamps non-solid, smaller and have the +NOGRAVITY flag in their DECORATE. Oh, while I'm thinking about lights, if you aren't using attenuated lights already, it's a good idea to use them. They cast a much more realistic light and interact with models and scenery much better than the standard lights. The only thing to be aware of is that they tend to need to have their radius and brightness set a bit bigger/brighter than the standard lights. GLDefs definitions are easy to update (just add attenuate 1 to the code for each defined light and adjust the brightness/radius as required). Map-placed lights are a bit fussier because you'd have to replace them with the attenuated lights, which have a different editnum and then adjust any parameters. Probably not worth it unless you were reworking a whole area anyway. OK, thanks. When I get a chance I'll look at what you just sent. I had already updated your models with the method I described above, with the intention of making the lamps switchable via the dormant flag. I'll look at how you've done it and see if I need to adopt your method. I had also made all the lamps solid, and given the nogravity flag to the wall lamps (which you had also done). I will use attenuated lamps (which I hadn't thought about until you mentioned it). The one thing I'm somewhat concerned about with light attenuation is that the brightness will diminish with distance. In the maps I'm creating, I'd like the lights to appear bright even at a distance, as at least two maps have structures at considerable distances that are visible. Now, a question: I had decided that I would use the red, blue, and white light color scheme for the gothic lamps too (one color for each of the 3 models). I used pointlights via a doomdefs lump. The lamplight part of the model gets nicely colored with the red and white lights, but the lamplight portion of the blue lamp doesn't get (or barely gets) colored. I tried modifying the height of the pointlight, which reduced the blue coloring even further. Without seeing what you've done: the model skin obviously has a reddish colour to it. I assume you've recoloured that? The brightmap is also coloured reddish and this might be sapping some colour from the blue effect. You could either greyscale the brightmap to allow it to be used on a skin of any colour or replicate it and colour it appropriately for your other skins (a coloured brightmap does colour the texture it is applied to slightly). I have noticed, however, that some colours are easier to make appear bright than others. Blue sometimes gives me problems. If it's strongly blue, it looks too dark, if it's bright, the blue can get washed out quite easily. I've found that making a blue colour a bit more cyan-ish rather than pure blue can sometimes help. On the attenuated lights, I'd just use a combination. If attenuated ones work well in a certain situation, use them. If the standard ones look better somewhere else, use them instead. ... I'll post what I've done and you can see how it needs to be tweaked. I copied the tech lamp from GeneTech & set things up. However, the lamp doesn’t show up in-game. I know that the actor is there (because of the blocking I set up), but no lamp itself. I wonder if it has anything to do with the way the model frames are set up. Other models use POSS A or B, but the tech lamp uses MOD1. I looked through your pk3 to see if I need to create a new definition for a “dummy” actor from which the tech lamp inherits properties, but I saw nothing. Any ideas? Ahhh! Yes, change any instance of MOD1 in the DECORATE MODELDEF and DOOMDEFS/GLDEFS to POSS. I used MOD1 (plus many others) as a dummy sprite name defined in the textures lump because I needed literally hundreds of sprites for the models in Gene-Tech so simply repurposing the default doom ones wasn't the best route. I'll look at your file later today.